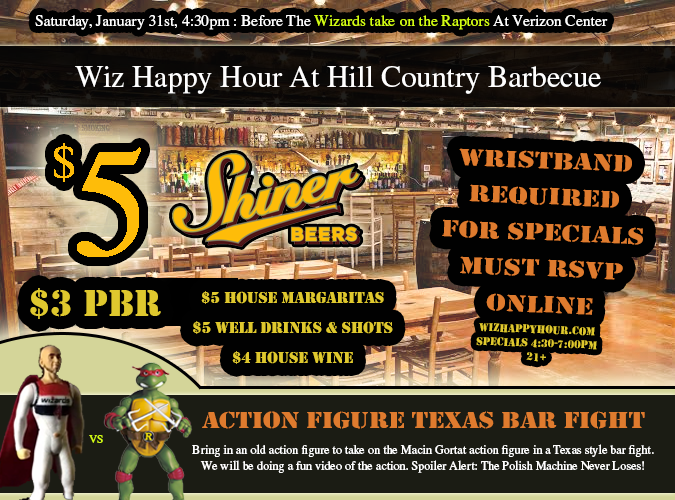 Washington Wizards Fan Happy Hour: New Happy Hour Specials For Wiz Happy Hour Only Saturday At Hill Country! New Happy Hour Specials For Wiz Happy Hour Only Saturday At Hill Country! Before the Wizards take on the Raptors on Saturday (4:30pm-7:00pm) we are holding a fun pregame happy hour at Hill Country Barbecue (Downstairs Bar) who has now given the Wiz Happy Hour crew a special Saturday happy hour with bonus drink specials now including Shiner drafts! In order to take advantage of these Wiz fan specials, you must RSVP to the event and check-in with me when you arrive to pick up your wristband! (If you don't have facebook email me or tweet me or call me to get on the list). Because the game promotion is a free Marcin Gortat giveaway, we will also be celebrating the Polish Machine Marcin Gortat. We'll have Gortat masks, photos with a giant Gortat head, and be filming a cartoon like Marcin Gortat action figure Texas Bar Fight. Fans are bringing in other random action figures (power rangers, star wars) to clash with Gortat. It should be a great time!